how long can I leave mineral water after opening the bottle before it expires? Had a bottle of evian in my room for 2 weeks, have had half but just got back to uni now and thinking shall I drink it! Lol, it's water.. wtf happens to it? Just pour yourself some tap water. You won’t die from drinking it but the fact that you've already drunk from the bottle two weeks ago isn't very hygienic and I bet it tastes purely of plastic. It's even worse if it's left in the sun. Just pour yourself some tap water. You won’t die from drinking it but the … Just pour yourself some tap water. You won’t die from drinking it but the fact that you've already drunk from the bottle two weeks ago isn't very hygienic and I bet it tastes purely of plastic. I don't know why but the tap water at uni accommodation just doesn't taste right! I don't know why but the tap water at uni accommodation just doesn't … I don't know why but the tap water at uni accommodation just doesn't taste right! if people can drink there own pee then why not get on with it. do they not have those water bottle thingys around instead of tap water? lol, I just drank it, seemed fine, now lets see what i'm like in the morning in my 9 o'clock lecture!! Never leave water in the sunlight in plastics. Toxins are carcinogenic. but fill your own bottle, even as clean as you can be, and it goes rank in less than 1 week, opened or closed. bottled water is a very controlled environment, sterilised bottles, and … bottled water is a very controlled environment, sterilised bottles, and the water doesnt contact anything, and in a closed airless system so doesnt get many microbes and stuff in it, so it keeps for like a year unopenedbut fill your own bottle, even as clean as you can be, and it goes rank in less than 1 week, opened or closed. Ok, so when the water is being used, it comes out of the bottle and leaves a pocket of air - if thats left for a few weeks, why aint it green ? Ok, so when the water is being used, it comes out of the bottle and … Ok, so when the water is being used, it comes out of the bottle and leaves a pocket of air - if thats left for a few weeks, why aint it green ? @ the OP....... what's Evian spelt backwards ? Some bottled water only carries its bottling date or a 'best by' date. These dates are helpful because the flavor of the water will change over time as it absorbs chemicals from its packaging. The flavor will not necessarily be bad, but it may be noticeable. Leaching of chemicals from packaging is a health concern, but as far as toxic chemicals go, you can get exposure to most of those chemicals from freshly bottled water as well as bottled water that has been on the shelf a while. A 'plastic' taste is not necessarily an indicator that the water is bad; absence of an unpleasant flavor does not mean the water is free from contaminants. coz its air tight nothing can get in or out til the seal is … coz its air tight nothing can get in or out til the seal is broken.......Some bottled water only carries its bottling date or a 'best by' date. These dates are helpful because the flavor of the water will change over time as it absorbs chemicals from its packaging. The flavor will not necessarily be bad, but it may be noticeable.Leaching of chemicals from packaging is a health concern, but as far as toxic chemicals go, you can get exposure to most of those chemicals from freshly bottled water as well as bottled water that has been on the shelf a while. A 'plastic' taste is not necessarily an indicator that the water is bad; absence of an unpleasant flavor does not mean the water is free from contaminants.While algae and bacteria will not grow in sealed bottled water, the situation changes once the seal has been broken. 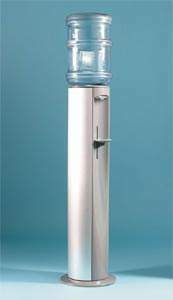 You should consume or discard water within 2 weeks after opening it. once they are opened no-one should expect 2 weeks for anything, it seems me and the OP are pushing our luck for the sake of science! I dont think they expect containers that have been opened on water … I dont think they expect containers that have been opened on water coolers to last weeks, its the unopened ones that last agesat least its just air that is getting in, not peoples hand bacteria and mouth backwash once they are opened no-one should expect 2 weeks for anything, it seems me and the OP are pushing our luck for the sake of science! I've not heard that for many a year ! I'm talking about these..... the air that replaces the water comes from the external atmosphere, presumably carries germs, dust, microbes and the like.... ? and i cant spit the water back into the container, so you are safe from my backwash! We do that here sometimes but we wash them first before refilling - and we're still alive.